Are you searching the best wet look concrete sealer? And do you want one that is darkened or with a high gloss finish? There are different types of Concrete sealer, and wet look sealer has some specific features. Read this Wet Look Concrete Sealer Reviews to know more about it. Wet Look concrete sealers have continued to grow in popularity over the years. But what you prefer may be different from what your neighbor loves. Therefore, it is good knowing which wet look concrete sealer is ideal for you. Solvent-based acrylic wet look sealers are created to darken the surface and make it wet. On the other hand, water-based acrylic wet look sealers provide a high gloss shine without darkening but make the concrete to look wet. Sometimes, wet look sealers can be used to cure and seal concrete surfaces or be used as decorative surfaces. When choosing a wet look concrete sealer, ensures that it is breathable, offers protection, durable, and non-scratch. This is one of the best concrete and masonry sealers on the market. 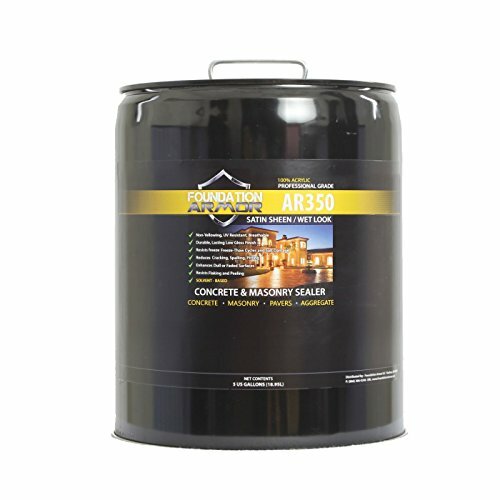 Foundation Armor AR350 sealer is a solvent-based acrylic sealer that will provide your concrete with a satin wet look after being applied. This sealer is very easy to apply by using a sprayer or roller. It will also cover 1000 square feet, which is enough for your patio and driveway. But the coverage depends on the porosity of the surface. Additionally, the acrylic sealer is durable and contains a non-yellowing formula. So, your concrete will not lose its color easily. Apart from being applied on exterior surfaces, you can also apply it on interior concrete surfaces. Just follow the right procedure of applying it and it will offer protection for many years. If you want to give a wet look to your concrete sealer, look no further than the EnduraSeal acrylic sealer. 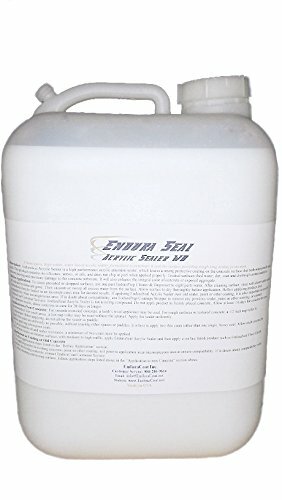 EnduraSeal is not only a trusted brand but as well offers some of the most reliable concrete sealers today. The EnduraSeal wet look sealer is versatile as it can be put on dyed, aggregated, and stained concrete surfaces. This sealer leaves a high solid and protective coating on the surface that not only seals but as well waterproofs. When correctly applied, it can protect the concrete from oil, grease, water, soot, dirt, and prevents the growth of mold. The concrete sealer covers a wide area of up to 400 square feet per one gallon. Thus, a single container can be used to seal your entire sidewalk and patio. Use a roller or sprayer for excellent results. KILZ is another quality brand with great performing products. 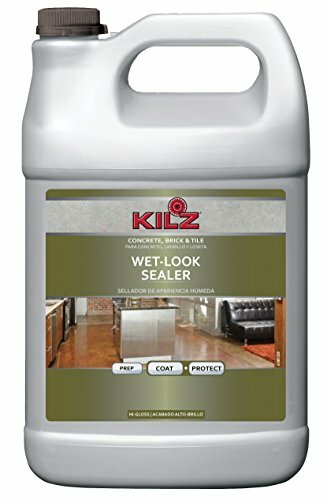 The Kilz wet look concrete sealer will give your surface a shiny wet look after being applied. It is made up of a non-yellowing acrylic-based formula that enhances the surface where it is applied. The sealer takes only 1 hour to dry and can be recoated within 4 hours. The surface should be properly cleaned before sealing for outstanding results and longevity. It can protect the concrete from water penetration, spills, grease, mold & mildew growth, UV rays, and color fading. While selecting a wet look concrete sealer for your driveway, ensure that it is breathable, durable, protective, and scratch resistant. The three sealers that we’ve talked about offer exceptional features and will essentially change the look of your concrete surface. Choose the one that meets your needs. Q. How much does a sealer cost? Ans. This depends on the type of sealer. Normally, Urethanes and epoxies are costlier than acrylic-resin sealers and chemically reactive penetrating sealers. But the best thing to do is to get a sealer that meets your needs and demands no matter the cost. Q. How will a wet look concrete sealer make my surface look? Ans. Wet look concrete sealers are usually solvent-based acrylic resin sealers, water-based acrylic resin sealers, and epoxies. So, they contain substantial color enhancement that gives the concrete the high-gloss wet look. Others have other finishes like satin, gloss or even matte.